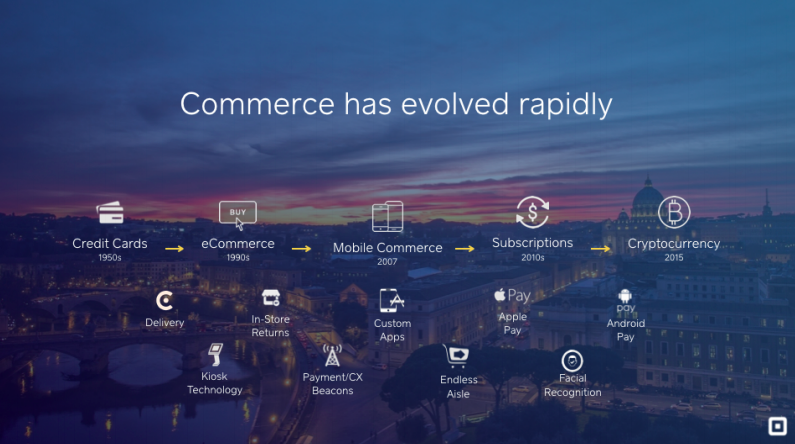 Commerce has evolved rapidly. In the 50’s credit cards came on the scene. In the 90’s ecommerce started to take off. In 2007, we saw the rise of mobile commerce with the invention of the iPhone. We’re also starting to see new ways people are paying – whether they’re paying with Apple Pay, Android Pay or even cryptocurrency. And we’re just at the beginning. Mobile commerce is actually growing 3 times as fast as eCommerce in general. It’s predicted that by 2020, half of ecommerce will be transacted on mobile devices. And if you’re not buying from your phone, you’re at least using your phone or mobile device to contemplate buying. If you ever see someone on their phone when shopping in a department store, they could be texting a friend, but they’re probably price comparison shopping. Or they might be reviewing other people’s feedback on the product. 82% of consumers at least consult their mobile device before making a purchase. I mentioned before, we are getting pretty comfortable entering our credit card details on many websites. Last year 44% of purchases were made with a card already on file, and it’s not only with the big guys like Amazon. This creates an experience where you don’t have to enter your billing and shipping address every time, and you can see what you ordered last time. This also enables the merchant to make recommendations for you so that makes your shopping experience feel a bit more personal. A third of customers have a card on file with at least five retailers. So think Target, J.Crew, or the Gap. Or any other retailer under the sun. More and more retailers are employing card on file because they want to create that personalized journey and they also want to create convenience. After all, the fewer clicks the better when making a purchase. We’re also seeing a lot of retailers employ cart abandonment features. So if they ever realize when you’re shopping and then you got distracted and went to do something else, you might get an email saying “Hey, do you still want to buy this red T-shirt?” That’s because the retailer is watching you shop and seeing that you have abandoned your cart. So getting you reengaged into that shopping flow is part of their entire strategy to make you to come back and buy what you were shopping for. We’re hearing that brick and mortar is going away, and we are observing that to some extent. Traditional retail models are definitely failing. We’ve all seen over the past several years many retailers completely disappear. Does anyone remember Mervyn’s or Gottschalks? Or more recently, Toys R Us? Those guys no longer exist. Last year BCBG, a very popular women’s retailer went away. Williams-Sonoma is an interesting example. They’ve actually been at the omnichannel game for over 20 years. It all began when they started collecting physical addresses to mail catalogs to customers. It’s estimated that Williams-Sonoma collects an email address, a physical address and a phone number on 70% of purchases. So they now have a whole data mine full of consumer details. So, rather than merely send emails to with discounts to their leads, they are able to personalize the shopping experience. And that’s not all. They also are making sure that everything is mobile optimized since they know that over half of emails they send are being opened on a smartphone. They’re also trying to mitigate any unfortunate experiences you may have when shopping online. So say you find an item that is out of stock. Rather than simply tell you it’s out of stock, they’re instead letting you know that “Hey, the San Francisco location has that item.” So they’re doing the little things that are adding up. 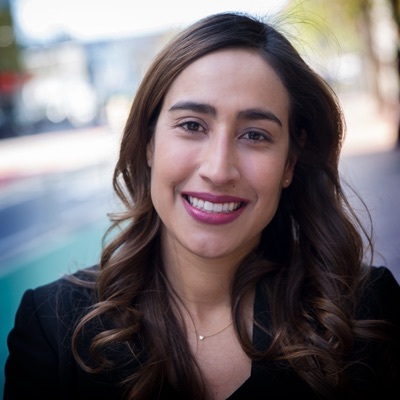 In addition they’re making sure their organizations are working together rather than in silos. So that means employees in the store are being given credit when a sale is even made online. Any retailer thriving in the omnichannel world has put the customer in the middle of the experience. They’re trying to figure out what is what is the customer doing, where are they discovering us, how are they being messaged to? They want to know if the customer was reached by email, or if they saw an ad on the bus commuting to work, or if they’re texting with a friend. Then, they’re ensuring that that data is entered into their omnichannel system via API to personalize that customer’s experience, such as by sending them an email about an online purchase they should consider. Sprint is another company that has started to think about the entire omnichannel experience through the consumer’s eyes. Back in 2015, they found out that 1 in 4 people who clicked on a Sprint digital ad ended up in a Sprint store. Taking this into account, they focused on bridging that experience. They realized that however that digital ad made their customer feel, they needed to emulate that same experience in store. They’re now able to track a single customer over multiple channels, enabling them to provide a much better solution to meet their customers’ needs. Other retailers that are making strides in this omnichannel world include Walmart and Target. You’ve probably seen self-checkout lanes. Again, this allows the consumer to be the center of the experience. Rather than wait in line, they can decide when they’re ready to check out. In the quick service restaurant (QSR) space, we have Panera 2.0 self-order cafes, which are outperforming traditional cafes. Consumers can go into a cafe, enter their order without mistakes, and even be upsold—perhaps on items that an employee may forget to mention. This also allows the employee to focus on what they do best – creating the food order. So what’s the common thread? We know brick and mortar isn’t going away. We know ecommerce is continuing to grow. We know this concept of personalized journey is continuing to pick up. Customers are expecting what they want, where they want it, how they want it, when they want it. And they’re not just expecting a trip to a store. They’re expecting an experience. The picture to the left is a London Apple store. On first glance it looks like it might be a cafe or a student gathering area. It doesn’t feel like a store at all. The picture on the right is a New York location of Everlane, which is an ecommerce retailer. They started in the online world moved to also providing pop ups in various cities. Again it doesn’t feel like a traditional brick and mortar retailer. It looks like a plant store. But it’s providing an experience, and a different way to to shop. While it’s convenient to buy online, we still often want to touch and feel and try on what we’re buying. Thriving retailers are now focusing on experience. 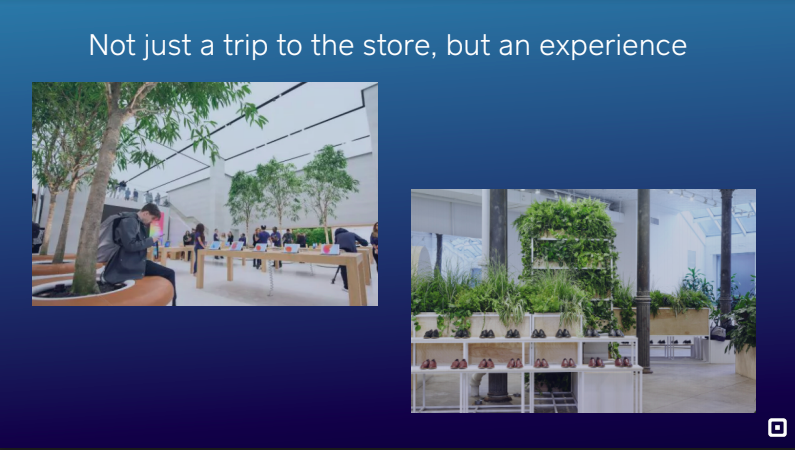 “Experience” meaning experiencing the brands, the knowledgeable employees that work at the stores, and also the products. Bonobos Guideshops are another example. These stores are designed for gentlemen to come for a 45-minute appointment, and be guided through choosing an outfit. It’s very personalized. Nordstrom, too, announced a few months back that they will be rolling out Nordstrom Local. These are 3,000 square foot locations compared to their 140,000 square foot, seven-story locations. These locations aren’t being designed to hold inventory. They’re being designed to provide personalized shopping experiences. There are salons inside where people can get their hair and nails done. There’s a bar with not just alcohol, but also fresh pressed juices and coffee. So it’s creating this environment for their ecommerce shoppers to perhaps come in store try something on, and think about buying it later online. Or they bought online and they want to pick up locally in store. If that’s the case the store actually will work with a larger Nordstrom seven-story location to have the inventory transferred before pickup. There’s a lot of coordination happening behind the scenes. The first and foremost purpose of these locations are not to sell in-house inventory—they’re creating an experience. Warby Parker has also moved from ecommerce-only to having pop up stores in major cities. They cater to allowing you to try on frames, but you’re not necessarily leaving the store with those frames. You’re having them ordered to be delivered to your home. Casper is another great example. This company started in 2014 they designed mattresses that can be delivered in a 20 x 20 x 40 inch box. You open this box and the mattress expands. You can return it after 100 days if you don’t feel that it’s meeting your comfort needs. In this way, Casper reacted to this demand for consumers who want to experience their product and brand. They have recently started to roll out more locations for people to come in experience what their pillows, and their beds feel like ahead of making a purchase. This has allowed them to traverse that online and in-person shopping experience. Then we have the overachievers. 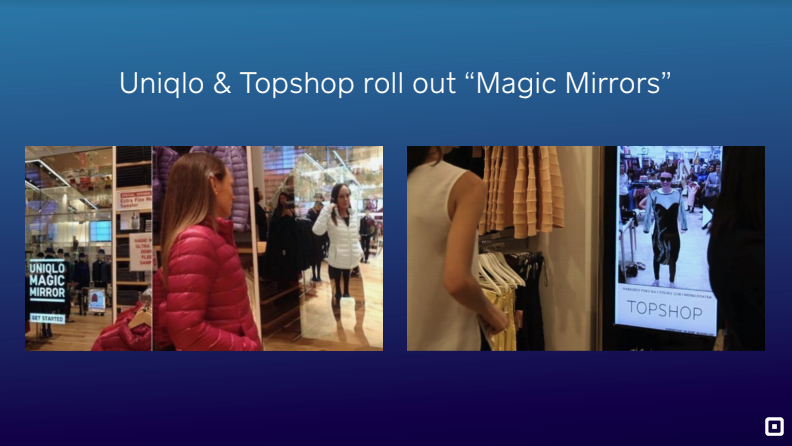 Both Uniqlo and Topshop have rolled out magic mirrors. The woman in the pink jacket on the left she is looking in the mirror at an image of herself wearing a white jacket. Rather than finding an employee to help her see the right color and size, she’s able to tell the mirror what color she wants to see. On the far right we see a woman not even wearing a dress, but looking in the mirror and seeing the dress on her frame. It’s not just shopping, it’s an experience. It’s even entertainment. Sephora has also rolled out recognition kiosk technology so you can sit down at a makeup counter where, rather than putting lipstick on, you can have your face scanned. They’ll then give you recommendations based on factors like your skin tone, or styles you’ve previously purchased. So how does this tie back to Square? I’ve given lots of examples of omnichannel. Omnichannel is a very big focus for Square not only know this year but in the coming years. At Square, we define the omnichannel experience as enabling sellers to reach buyers everywhere they are. We believe that the sales channel extends beyond a website, beyond a brick and mortar location. We also believe that commerce extends beyond the actual purchase. The reality is that buyers are everywhere. They’re on websites, they’re on apps, they’re their phones, they’re on chat channels like Slack, and they’re reading reviews on Yelp. It’s important for sellers of all industries to be able to reach and engage with those buyers no matter where they are on the buying journey. Whether they’re in discovery, at the moment of purchase, during fulfillment, dealing with returns and refunds, giving feedback or even at the loyalty phase, sellers are providing that continued engagement with the customer. Square works with many kinds of partners to deliver these unique experiences. We give sellers choice and offer them the best tools, even if that doesn’t mean we’re building all of these tools. We’ve invested very heavily in platform and we value and depend on our partners and developers to help provide these very unique omnichannel experiences. Our partners such as Bigcommerce, Woocommerce, Ecwid and GoDaddy have all built omnichannel solutions. They’ve enabled our sellers to create an item catalog once and then deploy that to be their three locations, or their website. Then once their inventory starts to deprecate they can see the true inventory count across all locations. We all know Shake Shack for their delicious burgers and fries, but they’re not only a QSR—they’re a tech innovator. Shake Shack partnered with Square and Fuzz Productions to offer self-service ordering to improve speed and experience. They now offer not just self-order kiosks in stores, but also pre-orders on their app and then pick up in-store or delivery options. They’re looking to their customer base and understanding what it will mean to keep them engaged. They’re making sure that there’s not that rush hour line that actually makes their customer choose another option for lunch. I’m sure we’ve all been in that place where you’ve shopped around for 10 or 15 minutes, and then you go to the checkout line and it’s out the door. You decide you’ll buy it online later. Then you go home and you can’t find it online. The North Face partnered with Square to deploy mobile point of sale, which cut down on congestion times that the registers. What we’re trying to do here is to help these larger retailers to prevent any loss of sales by enabling them with line busters. In the transportation space, D.C. taxis worked with Square to create complete digital meters that accept credit card payments. Gone are the days of the taxi driver asking people to pay in cash. D.C. is now the first city where taxis completely accept digital payments. TNT fireworks partnered with Square to deploy 6,000 mobile points-of-sale across 4,000 locations. A seasonal business, they needed to be able to quickly send out these thousands of points of sale and to quickly train their staff—often temporary employees — on using them. Then, in real time, they could track how all sales across all locations were going. And late last year, Eventbrite partnered with Square to provide an omnichannel experience for event organizers, enabling them to manage ticket sales, food and beverages, and merchandise at events. Q: What are strategic areas you are looking to partner in as it relates to omnichannel or future growth initiatives for Square? Great question. As we continue to focus on the omnichannel experience we’re looking to partner with not only platforms and technology partners, but solution providers. For example, Fuzz Productions worked with us and Shake Shack and used our pay SDK to build a unique kiosk experience. We’re finding that as we move upmarket a lot of larger retailers are not only looking at the technology, but they’re also looking at someone to help build more custom solutions. Often those are value added resellers, solution integrators, and consultants.